Designers, suppliers and manufacturers use the 3DEXPERIENCE Marketplace to fulfill orders for new business. Want to join the party? Then join the 3DEXPERIENCE Marketplace. Whether you are seeking bids on your latest design or offering to produce it, you need to know how to connect with new vendors and customers on the 3DEXPERIENCE Marketplace. Dassault Systemes created this 3DEXPERIENCE Marketplace so the SOLIDWORKS and CATIA communities including designers, producers, and suppliers can connect and efficiently do business on one common exchange. It’s a win-win for everyone. Designers and engineers get fast quotes and can move to production quickly while suppliers and manufacturers get new business leads and can expand their book of business. To begin benefiting from the 3DEXPERIENCE Marketplace, all you need is to login with your SOLIDWORKS account, upload your CAD data, select the service providers you want to get quotes from and you will receive quotes within hours. You can choose service providers based on a wide range of criteria such as manufacturing capacity, tolerance, turnaround time, etc. To see an example of how the exchange works, check out this blog. For suppliers and manufacturers, it is just as easy! 3DEXPERIENCE Marketplace is great for two kinds of vendors: those who fabricate and those who sell parts. Partners who fabricate participate in Marketplace | Make. Partners who sell components participate in the Marketplace | Part Supply. 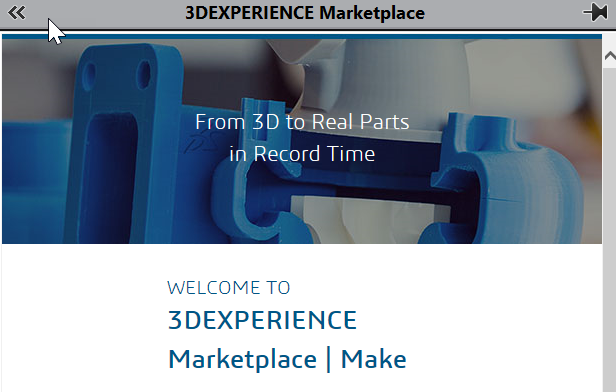 The 3DEXPERIENCE Marketplace facilitates business in 3D Printing, CNC Machining, Injection Molding, Sheet Metal, Laser Cutting, and much more. Recommendations and/or relationship with existing customers or Resellers: does the potential partner work with some of our SOLIDWORKS & CATIA customers, are they a customer themselves? References from customerApprovals usually get turned around in just a few weeks. Now that you know how to join the party, why don’t you send an email to marketplace.make@3ds.com to sign up?